I love being a wedding photographer. The wedding day and preparation are so much fun and special for me (yes, you can call me crazy). There’s always so much anticipation, excitement and beautiful chaos that I completely enjoy. While wedding days are wonderful, I think engagement sessions with my couples are equally as exciting. This is usually the time throughout the whole process where I really really get to know my couples. Plus, we’re able to slow down and take our time navigating the session and really get to have a lot of fun in the process! So when Christina emailed me and said her and Michael would be in town in March from Atlanta, where they currently live, I was super anxious to dive on in and get to know them! 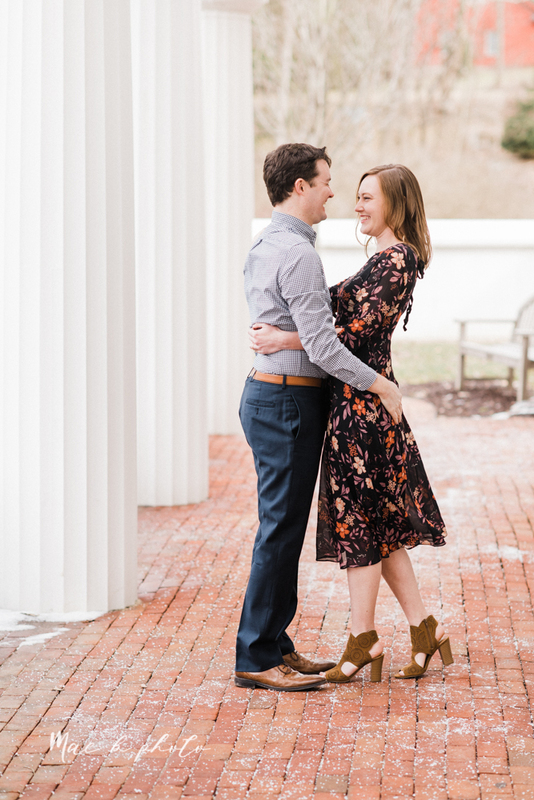 Prior to this, I had only spoken with them through email and a Skype date, so I knew this session was going to be even more important to see how these two interact with each other in person. And I’ll be honest, I immediately adored them! Like, instant wanted to be their friend and was so happy I got to spend my afternoon with them! It was legit one of those laugh and smile so hard for hours that it hurt. I could instantly see why they had been together for such a long time and why they were spending the rest of their lives together. Beyond anything, they genuinely enjoyed each other’s company and all of the silliness that came with that. It couldn’t have been more special! Christina is from Poland, Ohio and Michael is from Iowa. I love how Christina chose her locations that were not only personal to her growing up in the area but also a special location that they visit nearly ever time they’re in town. We started their session on a sunny March day in Poland Forest, taking full advantage of all of the great paths, trees and mossy covered logs. Then we went down the street to the Poland Library for a change of scenery, with the beautiful white columns and brick walkways. Lastly, we wrapped up our session with some bomb ice cream at Handels Ice Cream in Canfield, Ohio. Who wouldn’t want to end a session with ice cream?! The first time I talked with Christina and Michael, they told me how they met in marching band in college at Notre Dame. Being in band together, they saw each other all the time, so an instant friendship was born. Because they were friends and were always together, they never really had an “official” first date. Christina recalled the time that Michael taught her to ski in Michigan. Michael recalled the time he bought a pair of tap shoes so Christina could give him weekly tap lessons since she grew up dancing. I’m sure both events were equally silly and fun and totally them! One of my favorite things to learn about my couples is their proposal story. Everyone has such a different experience and a lot of times it is personal to the couple. Michael’s proposal plan was no exception. Knowing that Christina is Polish and grew up on classic Polish foods, he called off work to rush to a Polish restaurant while Christina was on campus. He picked up all of her favorite Polish foods (pierogis, kielbasa, kolache - the works) and had everything set up on the table in their new apartment for after he picked her up and brought her home. While she opened the door and saw all of the good food, Michael was behind her on one knee! Crying and hugging ensued immediately after and now they’re planning their late summer wedding at Drake’s Landing in Youngstown, Ohio!